INR stands for Indian Rupee. It is an official currency of the Republic of India which is issued and controlled by Reserve Bank of India. Rupee can be divided into paisa. 1 Rupee = 100 paisa, i.e. in 1957, the Rupee is divided into 100 naye paise. Indian rupee is available in denomination of coins and denomination of notes. Coin denomination have 1, 2, 5, 10 rupee coins and Notes denomination contains 1, 2, 5, 10, 20, 50, 100, 500, 2000 rupee notes. Sometimes ago, there were also the denomination of 1 paisa, 2 paisa, 5 paisa etc. but these small denomination have been removed now. It is believed that the rupee was first introduced in the Middle Ages (1486-1545) by the Sher Shah Suri at a value of 40 copper pieces per Rupee. Paper rupees were issued in 1770. During and after the British rule, a rupee was divided into or equal to16 annas. 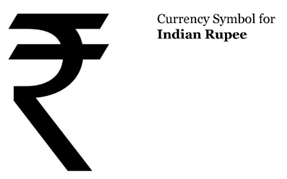 The symbol of Indian rupee "₹" is adopted by Government of India in 2010. it is derived from Devanagari consonant "ऱ". The implementation of security features are very important in Indian rupees because there is always a chance of duplication of Indian Rupee note. The duplicate notes may be the big cause of deterioration of economy.